Maximum size: 15 mm (Kay, 1979). Identification: This species has a greenish-brown body densely frosted with minute white flecks. Low, widely spaced conical papillae cover its surface but vary in development from "barely noticeable" to "prominent." The parapodia form two or three broad chimneys and have widely scattered black and white spots, the latter usually on the papillae. There is a translucent pink marginal band punctuated with darker pink blotches and a narrow yellow submarginal line. Most animals have a narrow yellow-brown line below the yellow one. 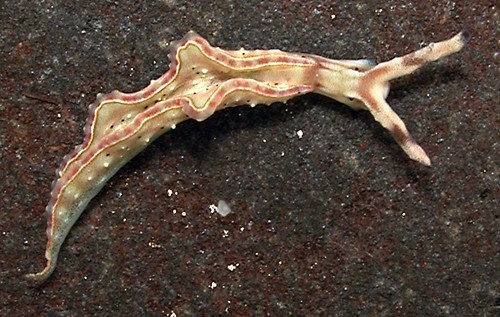 The rhinophores have dark, irregular medial bands and steel blue tips but one or both features may be absent. Natural history: Elysia lobata is a moderately common plakobranchid found on shallow rocky bottoms. It occurs in moderately protected to moderately exposed locations at depths of 1-2 m (3-6 ft). Mature animals are diurnally active and contract their parapodia rhythmically while crawling. A 7 mm animal laid a light cream egg mass of three whorls. It was 3 mm in diameter and the ribbon was somewhat irregular in width. Distribution: Maui, Oahu and Kauai: also known from Japan and the Marshall Islands. Taxonomic notes: Elysia lobata was first reported from Hawaii in Gould, 1852. Elysia elsiae Ostergaard, 1955 is a synonym. (Kay, 1979) It is also listed as Elysia sp. in Ostergaard, 1950. Photo: CP: 8 mm: Hekili Point, Maui; March 30, 2006.